The Indian oil and gas sector has traditionally been dominated by PSUs as a result of policy and regulatory barriers. The state-owned Oil and Natural Gas Corporation Ltd (ONGC) dominates the upstream segment, while the Indian Oil Corporation Ltd (IOCL) is the major player in the midstream and downstream segments. The government has been introducing regulatory and pricing reforms which will however take years to translate into increase in production. India produces only 15% of the crude oil it consumes domestically and imports the remaining 85%. Due to the limited availability of natural gas, the gas infrastructure is underdeveloped, with inadequate transmission and distribution pipelines, posing a significant constraint to the natural gas supply growth. At the same time, the oil and natural gas consumption has been rising fast, as a result of economic growth and government incentives. 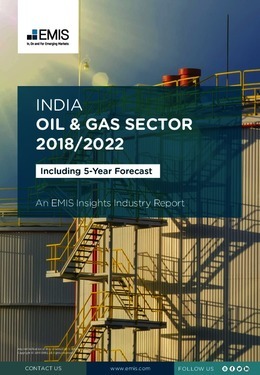 This report provides a complete and detailed analysis of the oil and gas sector for India. EMIS Insights presents in-depth business intelligence in a standard format across countries and regions, providing a balanced mix between analysis and data. Build a clear picture of the downstream, midstream an upstream processes.